Toast is a transient notification that stays visible for a few seconds before fading out. It provides a simple feedback about an operation in a small popup without interrupting the application. We can use Toast for debugging purpose as well. Toasts are excellent for informing our users of events without forcing them to open an Activity or browse a Notification. They provide a perfect mechanism for alerting users of events occurring in background services without interrupting the foreground applications. Generally, your application should show Toasts only if one of its Activities is active. The Toast class consists of a static make Text method that makes a standard Toast display window. 1. Open “MainActivity.java” file and add following JAVA code. In Android Studio, create a new Toast, pass the current Context, the text message to show and also the length of your time to show (LENGTH_SHORT or LENGTH_LONG) into the make Text method. Once the Toast has been made, you’ll be able to show it by calling show. 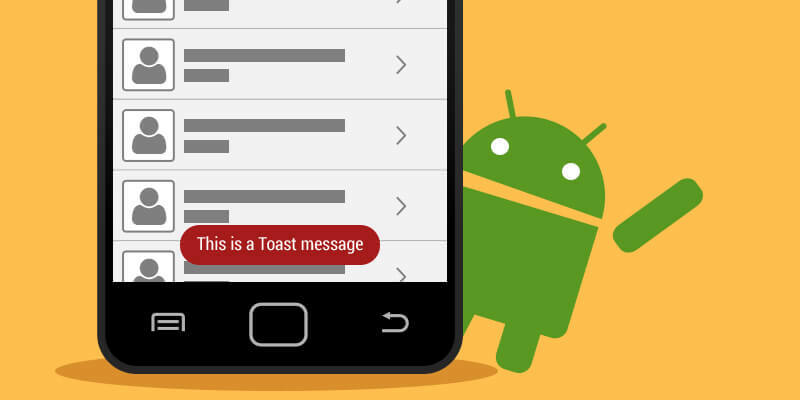 Sometimes a simple text message is not enough, we have to use a customized layout for our toast notification. To make a custom layout, define a view layout, in XML or in your application code and pass the root view object to the set View (View) method. Custom Toast in java, that Layout of the Toast is “customtoast.xml” call by View. By now, you should be able to create a Taost. Appinventiv Technologies is the most sought after iOS and Android app development company in India providing top grade mobile application development services across the globe. Appinventiv has been ranked No. 1 in Appfutura which is the most revered community for app developers. It has onboarded the best developers and designers who have a great expertise in the domain of app development.